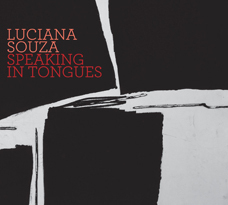 Jazz vocalist Luciana Souza is at her most daring with her latest release, Luciana Souza - Speaking in Tongues on the Sunnyside Records label. She deftly explores and melds musical heritages, cultures, and genres with her ensemble of Lionel Loueke, Gregoire Maret, Massimo Biolcati, and Kendrick Scott, and the listener is enriched by the journey that leads to new discoveries. Personnel: Luciana Souza – voice, Lionel Loueke– guitar, voice, Gregoire Maret – harmonica, Massimo Biolcati – acoustic bass, Kendrick Scott – drums, percussion. Luciana Souza – Speaking in Tongues was produced by Larry Klein and Executive Producer François Zalacain on the Sunnyside Records label. With her latest release, Luciana Souza explores and branches out beyond her musical base of Jazz, Brazilian, Classical and Contemporary, and the result has a rich freshness that is both unique and intriguing. The title, Speaking in Tongues, could easily be a reference to the ensemble’s diverse cultural backgrounds, Luciana Souza: Sao Paulo, Brazil, Lionel Loueke: Benin, West Africa, Massimo Biolcati: Stockholm, Sweden, and Kendrick Scott: Houston, Texas, USA, which contributes to the collective spirit and flow of the album guided by Luciana’s gifted husband, four time Grammy-Award winning producer Larry Klein. The 9-track release is described as, “Speaking in Tongues is a suite of musical poetry with the theme of language at its core.” The release opens with the funky, samba beat, At The Fair, written by Luciana Souza, which acts as a guide post in the musical journey set forth by the band. Next in the play list is the slow and serene Gary Versace song, Hymn, followed by Straw Hat, another Luciana Souza song. Filhos De Gandhi (Children of Gandhi) another song written by Luciana Souza, is the longest track on the release at 7:20, and has an inspired samba/African rhythm that is a definite highlight on the release. A Pebble In Still Water by Kendrick Scott and Mike Moreno, Free At Last a Luciana Souza song, A.M. by Lionel Loueke, and the last song on the release, No One To Follow, another Leonard Cohen and Luciana Souza collaboration, culminates the inspired musical journey. Websites where you can procure Luciana Souza – Speaking in Tongues are www.SunnysideRecords.com, iTunes and Amazon. © October 2015. Luxury Experience. www.LuxuryExperience.com All rights reserved.